This is a free event hosted by Ulster University & Partners. Dr Cherie Armour from the School of Psychology at Ulster University will commence the day with an introduction to the network; outlining our purpose and intention. 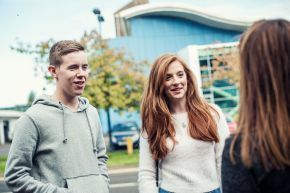 We aim to bring together educators, administrators, students and student support services, third sector organisations, researchers and policy makers to promote safer relationships for ALL by creating a starting point for future collaborations and research. Inaugral Conference: Promoting Safer Relationships within Higher Education. This conference will present current research on the promotion of positive relationships amongst students in the third level sector. The steps currently being taken to implement change and to address sexual violence against students will be reviewed. The conference will continue with keynote speakers representing the US, UK, and ROI. A series of workshops will follow. How to engage senior leadership to promote safer relationships between university students at U.K Universities and why this is important. USA developments and how NI/ROI can learn from the research. Sexual Consent and Students: What we know about consent and what we can do to support positive relationships. Bystander Intervention: Students as contributors to a safer society.